Being involved in an auto accident is always unpleasant. It’s even worse when the person who hits you flees the scene. Unfortunately, this happens all too often. Drivers may flee the scene of an accident for a number of reasons, such as if they have a warrant out for their arrest or they don’t have insurance. Whatever the case may be, being involved in a hit-and-run accident can be extremely stressful. You may find yourself wondering if you’ll ever get the compensation you deserve for your medical bills, lost wages, and other damages resulting from the accident. The first and most important step is to formally report your hit and run accident. Not sure where to start? Here are the steps to take when reporting a hit and run in Texas. Documentation is key in any accident, but especially after a hit and run. Try to recall as much as you can about the accident and the vehicle/driver that hit you. Knowing the make, model, and color of the vehicle – along with any distinguishing characteristics such as racing stripes or a cracked windshield – can be extremely helpful. If you see it, make sure to take note of the license plate number. You should also take time to document the accident scene itself. Take photos of the damage to your car, as well as the road conditions and the location where the accident took place. 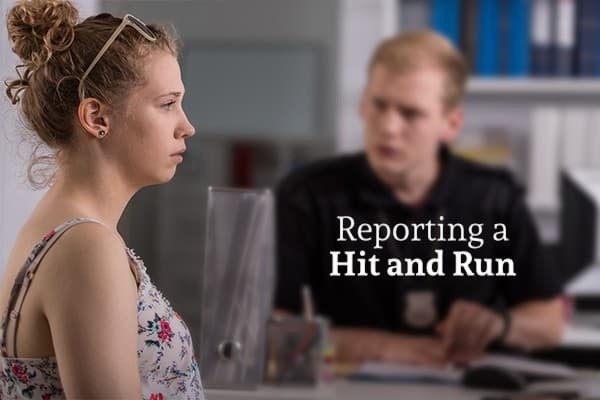 Filing a formal police report is a necessity if you’re going to receive compensation from your insurance company or from the hit-and-run driver. Contact the police as soon as possible after the accident. A police officer will be able to take down all the details of the accident, as well as any information you may have on the driver that hit you. From there, local police can be on the lookout for the vehicle and hopefully take him or her into custody. Always remain at the scene of the accident after a hit and run. As tempting as it may be to pursue the fleeing driver, your safety is more important. You never know why a driver could be running; he or she may be a violent criminal that you don’t want to cross paths with. Leave the apprehension of the offender to the police. If there are any witnesses present at the scene of the accident, don’t hesitate to ask them to stay on the scene until police arrive so they can provide a statement. If they’re unable to do this, ask for their contact information so that the police can follow up with them later on. Witness statements can really come in handy in a hit and run case, so the more statements you have to support your documentation, the better. Even if you don’t have any obvious injuries, it is imperative that you seek medical attention as soon as possible following the accident. Certain auto accident injuries, such as whiplash, may not show obvious symptoms right away. Furthermore, having documentation that you received medical treatment after the accident will be important if you choose to seek damages for any future medical bills, lost wages, or related expenses. If the driver who hit you is apprehended, you may be able to bring a lawsuit against him or her. Even if the driver is never found, your auto insurance policy may include coverage for hit-and run-damages. It’s important to remember that you should always consult with an experienced Texas personal injury attorney before calling your insurance company. An attorney will help you make sure that your insurance company – or the other driver’s insurance company – doesn’t give you less compensation than you deserve. Whether you end up filing a suit against the driver or need help negotiating a fair settlement with your own insurance company, the right attorney can make all the difference in the outcome of your case. At Machi & Associates, our team of personal injury attorneys is here to help you through every step of your hit and run case. Contact us today to schedule your free consultation.